The County President John Smith was honoured to have as guest at this years County Dinner the newly elected President of the English Golf Union Mr Elwyn Ellis who like last year was globe trotting by train to get to the function. dinner 2010.jpg The After Dinner Speaker for this year was Russ Williams one of the most sought after comedians on the After Dinner, Cabaret and Corporate circuit. 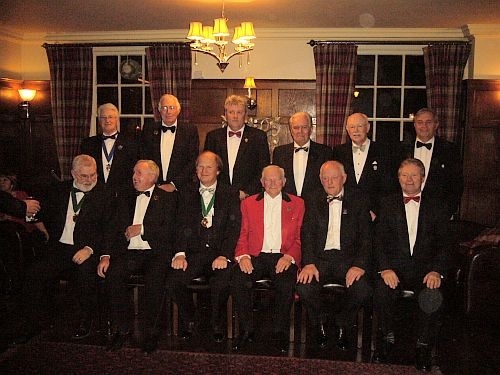 Our guests from around the counties were Mr John Rowe SWCGA, John Perkins Somerset, Geoff Rogers Devon, Mike Darby Gloucestershire, Malcolm Nixon Wiltshire, Mr Chris Tappin Kent, Mr John Bury Sussex, Martin Christmas Surrey, Tony Cullen Hampshire IOW & Channel Islands and Graham Binney Cornwall. The dinner was also attended by members from fifteen of our counties golf clubs along with the County Captain players and officials from the executive. On completion of a first class meal our Master of Ceremonies Mr Philip Gardner got the main part of the evening under way, with our Vice President Douglas Pratt giving the loyal toast. We were then heartily entertained by firstly Elwyn who was followed by a some what nervous John Smith, John had no need to be nervous his speech was delivered an eloquent touch and covered many areas of County Golf. Lastly Russ Williams entertained and he just did not disappoint his vast repertoire of funny stories and hilarious material had every one in the room laughing and was without doubt one of the most accomplished performances we have had for several years.